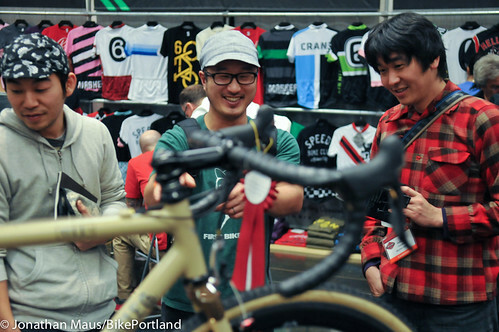 Shinya Tanaka is helping stoke Japanese enthusiasm for American-made bikes. The U.S. handmade bicycle industry has an Ambassador to Japan and his name is Shinya Tanaka. In the past few years, Tanaka, the 38-year-old owner of Circles bicycle shop in Nagoya, has melded his passion for handmade craft and love of bicycling into a healthy business importing handmade bicycle frames from a select crop of builders in Northern California and Oregon. Since 2005, Tanaka has staked out an impressive niche. He is the go-to guy for high-quality, U.S. made steel bicycles and he’s tending a blooming bike culture that has taken root at his bike shop. Ask Cielo Cycles‘ Jay Sycip how business is going and the first thing he’ll mention is their strong sales to Japan. “Japan” in Cielo’s case means Mr. Tanaka. Sycip says that in 2011, Tanaka bought more of their bikes than anyone else. Same goes for Napa, California-based Retrotec-Inglis Cycles. According to veteran builder Curtis Inglis, Tanaka is his largest wholesaler. 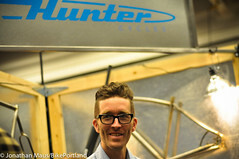 Other builders that have gained Tanaka’s business are Hunter Cycles and Sycip Bikes. 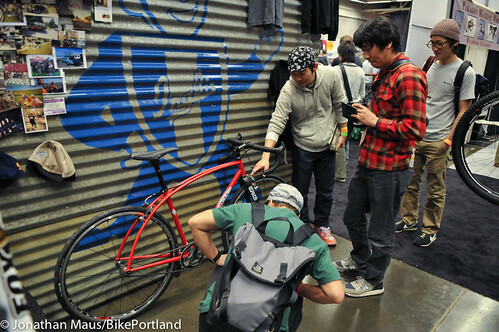 Shinya Tanaka (red flannel) shows customers — who flew into Sacramento from Nagoya for the show — his latest purchase, a custom road bike made by Curtis Inglis. Veteran Santa Cruz-based builder Rick Hunter has even traveled to Tanaka’s shop to do brazing demos and meet his customers in person (read more about his trip in the latest issue of Paved magazine). “He’s building a culture around handmade bikes.” says Cielo’s Sycip (not to be confused with his brother Jeremy who owns Sycip Bikes). For Tanaka, this Japan-U.S.A. connection started back in 2006 when he visited the North American Handmade Bicycle Show in San Jose, CA; but his love of handmade craft began much earlier. Tanaka was born in Japan but came to Seattle for college in 1997. When he got out of school his passion was fashion and he went to work in the bespoke garment business. “I love to work with people who are working with their hands,” he told me today during a conversation on the show floor. Japan is steeped in tradition when it comes to handmade steel bikes. Their keirin culture (a form of track racing accompanied by gambling) is part of the country’s national identity. While handmade bicycles play a central role in keirin, the tradition around it is stifling. Only certain builders are permitted to make keirin frames and they will not deviate from the standard, track racing bike design. Around 2005, Tanaka stumbled on the website of Oregon-based builder Mike DeSalvo. “I started talking with him and he’s such a nice guy!” A few emails and phone calls later, he had bought three frames. 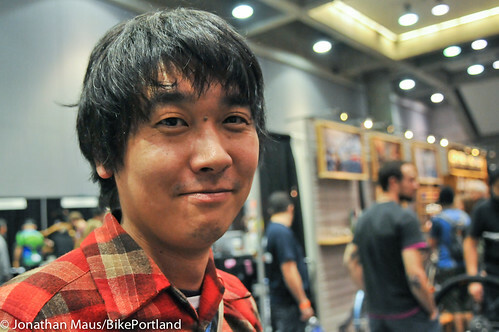 Soon thereafter, Tanaka also started his own bike shop and he traveled to his first NAHBS show in March 2006. He’s been coming to NAHBS and building relationships with builders ever since. At this year’s show, he brought 12 of his customers from Japan. They didn’t come to just gawk at the gorgeous bikes or to take a vacation. They came to shop, and to meet the builders of their bikes face to face. For Tanaka, not every customer needs to visit the U.S. before buying a bike (that’s why he’s building up an impressive inventory in Japan); but meeting the makers behind the frames is an important part of the process. Tanaka offers his customers not just access to American builders, but an education on materials. For Tanaka, it’s all about steel. And when it comes to steel, he understands that there’s a big difference between off-the-shelf, production steel bikes, and a handmade bike made to fit by a master craftsman. After he began importing bikes from Soma (a popular U.S. brand made in Taiwan), he realized the ride was different than his DeSalvos. “When your ride, you can understand the difference,” is how he put it. 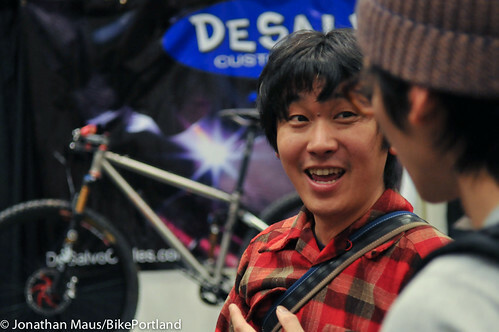 Tanaka is far from the only person in Japan that’s interested in American-made bikes. Independent Fabrications has a distributor in Nobeyama, Moots Cycles has one in Osaka, and other custom builders — like Bend’s Vulture Cycles — have customers in Japan. It also might have something to do with Tanaka’s infectious enthusiasm and genuine love for these bikes and the people who build them. As I finished up my conversation, Tanaka he thanked me for my time and was off to his next meeting. He had customers waiting for him — three men who traveled all the way from Japan to sample the finest steel bikes in the world. 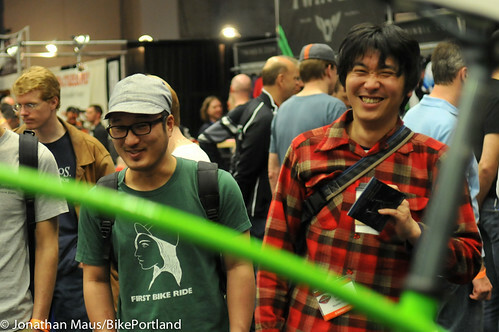 — This is part of BikePortland’s special coverage of NAHBS 2012. Read more stories and browse more images here. I am very happy that Mr. Tanaka has helped generating excellent level of interest in hand-made bike frames, especially those from the US. I spent several years working largely with Japanese clients as a strategy consultants, so I have some familiarity in how American cultures and ideas appear and can attract Japanese people. I think the fact that these are from the US added an additional level of mystic to the frames, and the distance and the higher cost makes exclusivity by scarcity. While most of them have their roots in Keirin, at least a good number of them on that list makes racing, randonneuring, and city, and camping bikes today. Toei is famous in the randonneuring world. My wife and I each have an Ebisu that’s built by a builder not on that list. Perhaps US builders are more willing to work with their customers’ individual preferences, where Japanese builders tend to build frames based on well-established platforms, practices, and designs. When I ordered my Ebisu several years ago, I found that the wait time (5 months) and the cost (at the time less than $1600 for a randonneur frameset with custom geometry, custom paint, and a matching front rack) was much more palatable than its US counterparts. Hiroshi (the proprietor of Jitensha Studio and the Ebisu brand) had his expertise, and some of my requests were deemed not appropriate for the frameset, but I am very happy with the results. Really interesting article, thanks for sharing it! Don’t forget Daisuke Yano too! Does huge business with IF- and puts on cyclocross races to boot. We’ve had Molly, Alexandra Burton, Heidi Swift and others go to his race in Nagano! The Japanese are nuts for cool bicycles. I used to be Sales Manager for Bike Friday. They loved our bikes! They love cool technology; they love things that work, they love things that are different; they love things that are well made. A perfect market for custom frame-builders. Yeah, the market for high-end consumer products in Japan is very robust. When I was there I saw lots of cool tracks bikes and stuff, modified for the urban environment.